Electric scooters have descended on our sleepy metropolis—and not everyone is happy. 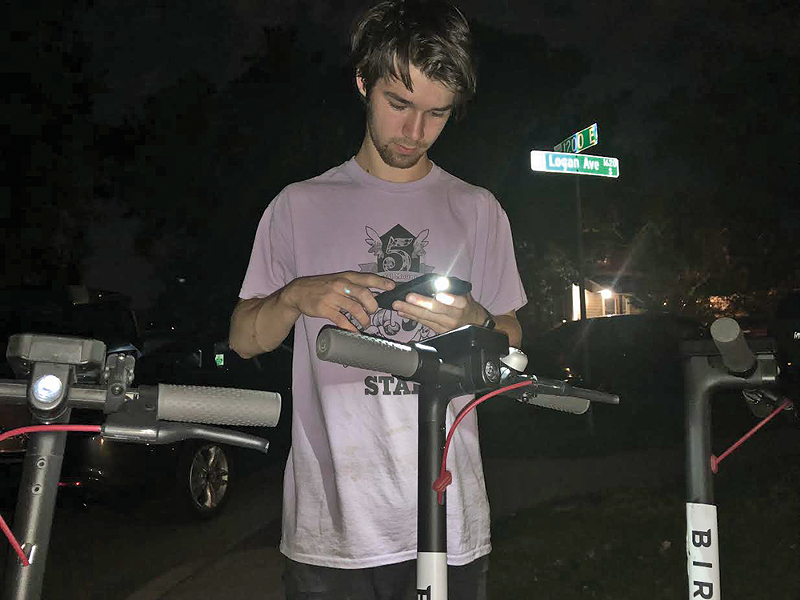 It's 9 p.m., and Caleb Lieber is on the hunt for Birds—not of the beaked variety, but steel scooters that have been carrying Salt Lakers around the city since midsummer. Driving through the Westminster College campus on a balmy August night, he finds one and puts it in the trunk of his Ford Fusion. This particular Bird chirps every minute—a relentless series of 10 beeps that serves as the soundtrack to Lieber's driving for the remainder of his trek. "It's a new Bird. They're sometimes pretty glitchy," the 18-year-old explains. Lieber is a "charger"—a member of the gig economy's latest fancy. He earns $5 for every scooter he charges in his home and up to $20 for "higher-bounty Birds" that have been marked as missing or haven't been ridden in a while. 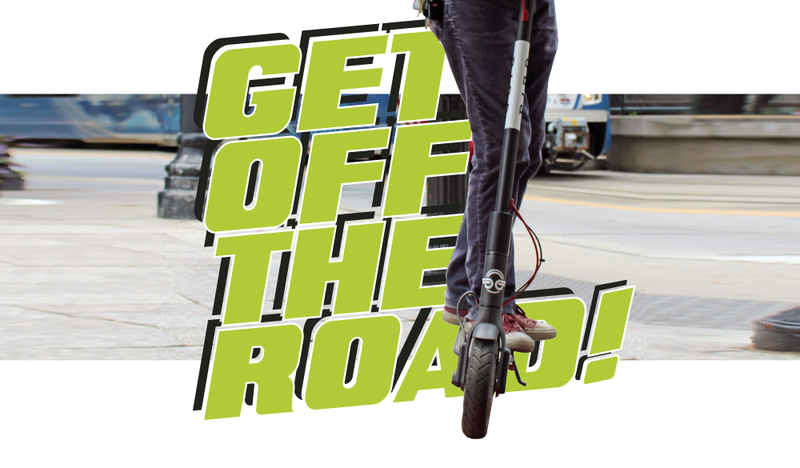 "They're more rare than not, but they're out there," Lieber says of the higher-yielding scooters, sounding like a modern-day Captain Ahab on the hunt for ever-elusive prey. Lieber works at a Murray hospital as a cook, usually from 10 a.m. to 7:30 p.m., a favorable schedule for a charger. Most days, he leaves his job and rests for about an hour, then heads to Salt Lake City on a collecting mission. After filling his vehicle—he can fit 15, max—he jets backs home and juices them back to full power. Around 4 a.m., he wakes up, drives back to the city, gingerly drops them off in their "nests" and heads back home. 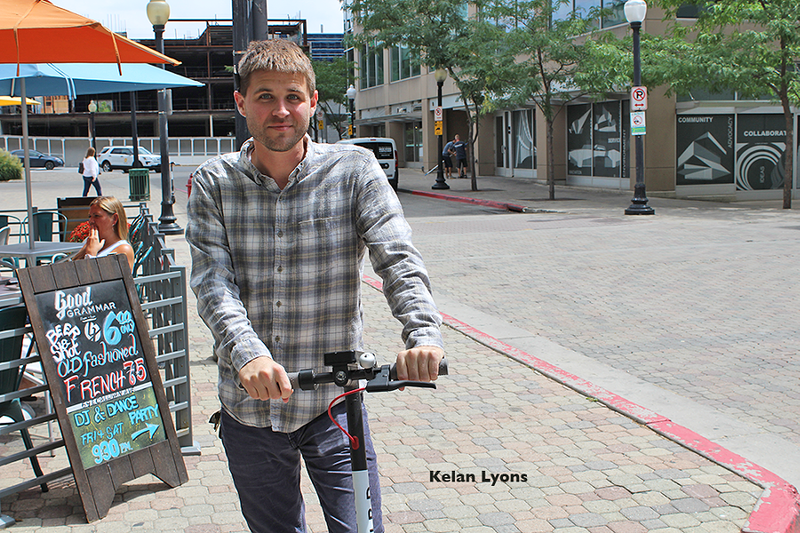 His efforts are enjoyed by downtown denizens like Angela Fina, a traveler making her way through Utah who rode her first scooter in Salt Lake City. "It's a fun way to see everything," the 24-year old says from atop a Bird on a recent weeknight. "It's the lazy-people biking," she says before whizzing north on a Main Street sidewalk, relishing the last few hours of sunlight before the chargers come out to collect. To satiate Fina and thousands of others who've jumped on the craze, Lieber one night spends 90 minutes on the prowl, and picks up orphaned Birds in Liberty Park, outside Proper Brewing Co. and behind a U-Haul on State Street. At one point, he pulls into the parking lot of a dive bar and tries to find a scooter that the app's map is telling him is nearby. "I've got a flashlight that I'll use when I have to," Lieber says, peering through the darkness as he searches for the black Bird. He doesn't need it. After a few seconds, he spots his bounty and walks over, taking out his phone to scan a QR code on the scooter's handlebars, rendering it off the market—effectively eliminating it from competing hunters' radars. Lieber ends up collecting a dozen scooters that night before calling it quits. With the malfunctioning Bird still chirping in the back of his car, he heads out of the city to catch some shuteye. On the ride back home, Lieber is already strategizing where he'll drop off his flock. "I try to mentally plan out my route to get the most nests in the quickest amount of time, so I can go home and sleep. I like sleep," he says wistfully as he drives down State, a pile of scooters behind him, nearly blocking the view from his rearview mirror. "I'll sometimes hear Birds going off when they're not around," he says of the persistent chirps that haunt his thoughts. "I'll be at work making, like, a pizza, and be, like, 'Where is it?'" The most recent development in ride-sharing technology scooted its way to Salt Lake City at the end of June. Currently operating in 19 and 22 states, respectively, titans Bird and Lime have swept the country and quickly become as ubiquitous as they are controversial. Since their arrival, motorized scooters have polarized city leaders and residents. 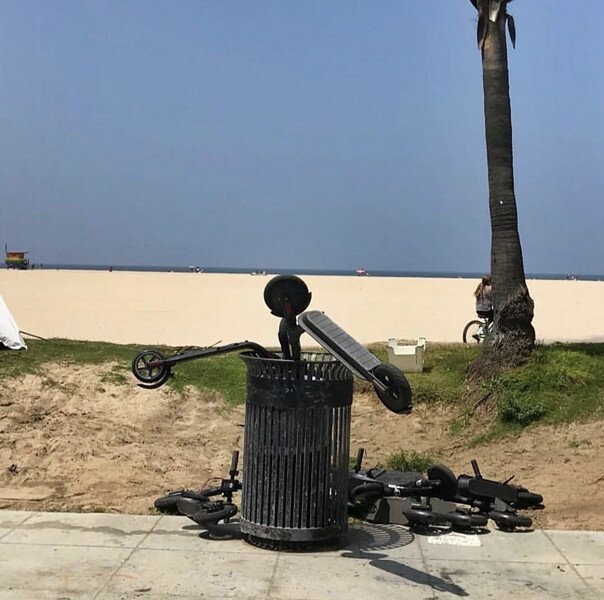 To list a few public spats, both companies deactivated their scooters in protest in Santa Monica, Calif., Bird's homebase, after a disagreement with local officials. Earlier this month, Bird temporarily removed scooters from the streets in Milwaukee, Wis., as the city grappled with their legality. Back in the Golden State, a Los Angeles councilman at one point sought their temporary ban. At times, the scooters have provoked urban dwellers' ire. An Instagram account called Bird Graveyard asks people to send pictures of damaged scooters so they "can honor [their] death. RIP." As evidenced by graveyard's feed, it's not uncommon to see scooters set on fire, thrown into bodies of water and even defecated on. That level of destruction hasn't peaked so far in Utah, but Lieber says he's found scooters in trees and dumpsters. "I've seen a few smashed Birds," he says. "It is funny, but it's very wrong at the same time. It's not your property." On the opposite end of the spectrum, Baltimore ended its bike-share program and entered into a pilot program with Bird and Lime for dockless scooters and bikes to be placed across the city. Both Lime and Bird are lucrative. In June, Bloomberg valued Lime at $1 billion. Both companies' corporate brass didn't respond to interview requests from City Weekly. This spring, however, Bird CEO Travis VanderZanden, an Uber and Lyft alum, seemed to be on a media blitz. "When you ride a Bird, it reminds you of being free," he told The New York Times in April. "It gives you freedom. Like you have wings." During the same conversation, he compared the initial outcry to what the first motorized cars represented in the horse-and-buggy days. "They had to figure out where to park all the dockless cars," he said in a scene that seemed reminiscent of HBO's Silicon Valley. A month earlier, VanderZanden emphasized Birds' environmental benefits. "Today, 40 percent of car trips are less than two miles long," the 39-year-old told The Washington Post. "Our goal is to replace as many of those trips as possible so we can get cars off the road and curb traffic and greenhouse gas emissions." On the practical side, they're also convenient and cheap to ride. Armed with a smartphone, users can unlock them for $1 and pay 15 cents for every minute they ride. Once your destination is reached, you virtually "lock" the scooter, thus freeing it for the next person and park it in locations that meet certain requirements. Depending on your perspective, it's either a convenient manner to go about your day or an annoying way to clutter city sidewalks. 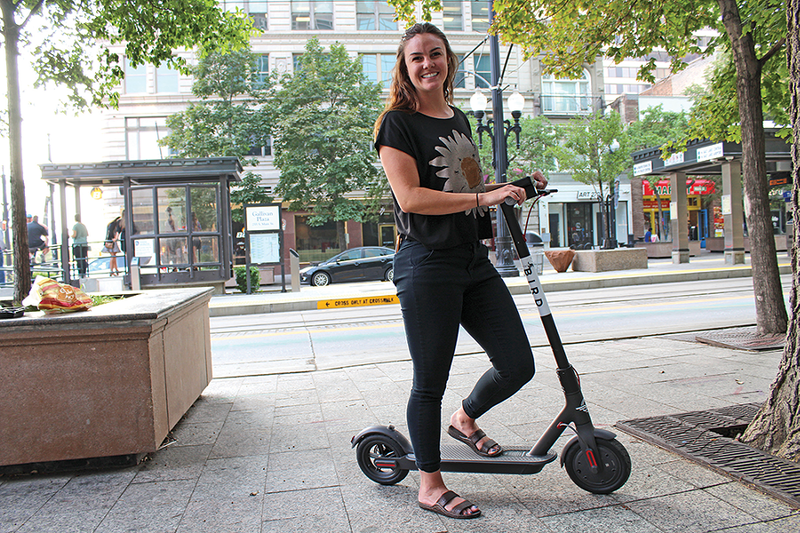 Following a "better to ask forgiveness than permission" pattern, Bird unleashed their first fleet of SLC scooters, seemingly overnight, without too much warning to city officials. Almost immediately, however, Bird yanked their flock as they ironed out an agreement with local leaders. Guidelines were in place by the end of July, and Birds and Limes were freed—giving the city time to work on an ordinance that'll solidify rules surrounding the zippy new forms of transit. Jon Larsen, Salt Lake City transportation director, says it was important that the yearlong operating agreement ensured equitable scooter distribution. "A lot of times the west side kind of gets overlooked," he says. The pact stipulates that dockless companies can place 200 scooters around the downtown area. If they allot 100 more west of I-15, they can then place another 200 downtown. In the meantime, the city is urging residents to take a survey that asks a slew of open-ended and multiple-choice questions about how far users traveled, whether they considered other forms of private and public transportation before scooting and where they'd like to see more dockless transit. "People actually think we should have more of these," Larsen says of the initial response to the questionnaire, noting at the time of the interview that only around 100 people had responded. He says the public is split about whether downtown needs a stronger presence, but are clamoring for more scooters in surrounding neighborhoods. Along with the tips, Larsen says he's also gotten some strong-worded feedback. "There's really no middle ground," he says. Highest on the list of concerns is sidewalk-riding. "It's dangerous and unnerving," he says. "There's definitely some education that needs to happen." Considering the maximum scooter speed is 15 miles per hour, even a minor collision could result in serious injury or damage. Bird offers to outfit riders with free helmets (barring a $1.99 shipping fee) and Lime's website says the company ships free custom-designed helmets "whenever possible" in an effort to further "educate" riders. Helmet use is not mentioned in the city's operating agreement, but Larsen assures he'll "put that on the list of 'items to be discussed,'" and that both Bird and Lime are required to have liability insurance. Underscoring the environmental shift scooters represent, both companies paint a utopian picture. "Salt Lake City and Bird have a shared vision of a community with fewer cars, less traffic and reduced carbon emissions," a Bird spokesperson wrote in an email. "In our time here, we have been inspired by how willing the community is to trade short car trips for Bird rides." In addition, Bird and Lime both have expressed interest in donating money to local nonprofits and to the city, to expand bike routes. Bird describes a revenue-sharing program on its website, offering cities $1 per scooter per day "so they can use this money to build more bike lanes, promote safe riding and maintain our shared infrastructure." Lime also has a "Lime Hero" program that allows riders to donate an additional percentage of their trip's cost to local organizations. Larsen says city and scooter company officials are discussing possible donations to bicycle nonprofits. The bigger picture, he says, is getting more people to properly use bike lanes to make the city safer for all. 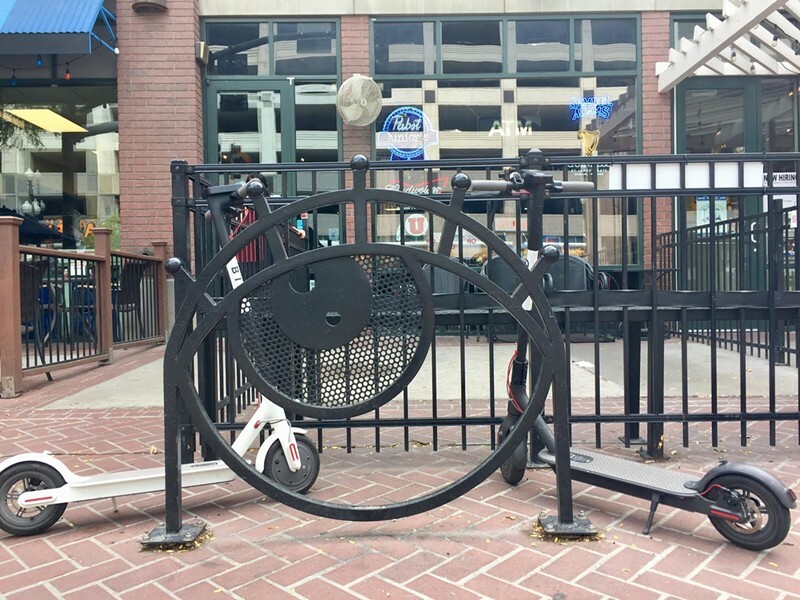 "If more and more people are using that bike infrastructure, and asking for [more,] it streamlines the process to get stuff built," Larsen says. "There's already a lot of political willpower. We have some fantastic momentum—and this is just adding to it." As of press time, only Lime and Bird are operating in Salt Lake City, but Larsen tells City Weekly OGs Razor recently acquired a business license, making Salt Lake City one of the first locations to offer their Razor Share program. In total, Larsen says six similar companies have at one point or another expressed interest in establishing a local presence. Ben Bolte, GREENbike founder and director, says it's important to distinguish between private and nonprofit transportation services. "Our goal is not to make money, and as a result we're providing a cheaper service that's more reliable," Bolte says of his bike-sharing model that's poised to almost double in size over the next year. Bolte says the $35 to $75 it costs to ride one of the bikes on his fleet for a year is cheaper than riding scooters for short stints—a nominal fee that can add up over time. 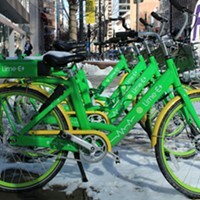 Between June and August, GREENbike spoke with community councils across the city, the Downtown Merchants Association and the city's Business Advisory Board. Bolte says only 10 percent of those surveyed said they'd prefer GREENbike go dock-free as it expands, though he acknowledges this sample size is likely more conservative than active users, who are most likely to park their bike on the sidewalk instead of having to look for a dock. Forty percent of those surveyed said they did not want to see electric scooters available for rent. "I'm not opposed to dockless inherently as a medium or mode," Bolte clarifies. "It all just has to do with how it's implemented." Across national test markets, haphazard dockless bicycle initiatives have proven to be far from worry-free. Last week, hundreds of bright-yellow-hued Ofo bikes met their maker at a San Diego scrapyard. On the local front, Bolte brings up San Francisco-based competitor Spin, which ended its dockless bike-share program at Utah State University. The move came hot on the heels of USU's Risk Management Office, in coordination with the college's police department, banning the company's motorized scooters on campus. "These aren't bad people or bad companies, they're just for-profit tech companies," Bolte says. "They see themselves as apps, not necessarily transportation." Bolte is also skeptical of scooters' inherent go-green mentality, since chargers have to crisscross the city to round up the scooters, then head back the following morning so they can drop them off. "That's a lot of extra driving," he says. "It's fascinating and it's exciting that all this new stuff is happening, but I think it's important we don't throw the baby out with the bathwater," he adds, asserting that ride-sharing is not public transportation's harbinger of doom. "OK, let's all just take a breath," he cautions. Although murders of Birds and bushels of Limes are starting to appear next to TRAX and bus stops, Keith Bartholomew, associate dean of academic affairs at the University of Utah's College of Architecture and Planning, thinks of scooters not as competitors, but as complements to public transport—specifically when it comes to the latter's so-called first-mile/last-mile problem. Essentially, how riders get from their home or workplace to public transportation and vice versa. "Whether it's a fad or whether it sticks around for along time, I think it's an inventive solution to fill a known gap in our transportation networks," he says. "This is not a competitor for UTA's business. If anything, it makes it easier for people to use UTA." Colleague Reid Ewing says ride-sharing companies can help or hurt public transportation. "Everything in transportation depends on travel time," the professor at the U's Department of City and Metropolitan Planning, says. Because the scooters aren't turbocharged, Ewing suspects riders won't use them as total substitutes to public transportation. "No one would take a scooter out to the airport from the Avenues," he says. Greg Wilking, detective with the Salt Lake City Police Department, is bracing himself for the influx of challenges scooters could usher in. "Chiefs of police get together and they talk. I guess it was a topic of conversation at one of their recent meetings," he says. "One of the police chiefs said, 'If you can at all, avoid it. Because there's so many issues that come with it,'" Wilking says before breaking down "issue after issue after issue" related to Bird and Lime. Like Larsen, Wilking says scooters are to be ridden in bike lanes and on roads—not on sidewalks. Considering the ones he's seen weaving around pedestrians since their arrival, Wilking issues this dire prediction: "You're going to have scooters colliding with people." Part of the issue, he says, is most cyclists know to ride bikes in designated lanes on the right side of the road. Newbie scooter riders? Not so much. Although he has yet to experience the rush of zig-zagging across the highly trafficked streets near his downtown office on a scooter, Salt Lake County District Attorney Sim Gill has noticed what he calls "techno trash" strewn about city sidewalks. Gill says he foresees more misdemeanor fines stemming from scooter use, rather than felony charges. "But, heck, I could pick up a motor scooter and hit you on the side of the head—that's a felony," he jokes. "That's an assault with a deadly weapon at that point." Gill stresses that the cases that make it through his office depend on the variables of each individual situation. "It's all going to come down to how law enforcement does the field work," he says. Still, Gill doesn't expect many accidents to escalate to chargeable offense levels. "The only time I would look at it, I should say, is if you're standing there and I go, 'Dude, I'm going to run into you,' and then I do it," he says. "That's an assault." Another unforseen concern for law enforcement is impaired scooter riding. "I think people are going to think about this as a way to get around from bar-hopping in the downtown area," Wilking says. "I believe we'll end up issuing DUIs to people on these scooters." The detective remembers a 2011 incident near a 9th and 9th convenience store involving a man on a motorized scooter who accidentally damaged a car. Police arrived on the scene and thought the scooter rider reeked of alcohol. Someone on the scene suggested processing him for a DUI. "'But I'm not driving! I've had seven DUIs, so I'm not driving,'" Wilking recalls the man saying. "So he knows he can't drive, but he's operating a motorized scooter." The errant scooter operator was cited. Noting that local law enforcement "saw the writing on the wall years ago," Wilking says it might be hard for police departments, already overwhelmed with a constant onslaught of cases, to track down someone operating a scooter under the influence. "It would have to be something very egregious that is taking place, and it's kind of hard to pick up on a driving pattern of somebody that is maybe on the sidewalk," he says. "We'd have to be called out to an incident." Birds power down at 9 p.m. and their green cousins at 11 p.m. Even so, with scooters becoming a fixture at impromptu pub-crawls, Wilking smells boozy complications on the horizon. "The question is, 'When?' And is it going to be because we did targeted enforcement and stopped people, or is it going to be because somebody gets hurt?" Despite his fears, he says there have yet to be any scooter-related calamities reported in the city. But his mind is reeling. "To have these things dumped like this; it's making our heads spin." Ultimately, Gill and Wilking view the scooters as newfangled personal transportation options—a growing sector they don't expect to go away any time soon. "It's just a brave new world in technology, and we're just going to have to deal with it as we go through it," Gill says. Fourteen miles from Bird's downtown nesting hub, the Sandy Skatepark is filled with teens and kids riding classic, foot-powered scooters used to perform tricks, not to get around. It's a far cry from the city's e-forms of transit. Here, scooterers get airborne and perform "tailwhips"—where riders spin the base of their scooters in mid-air before landing in a regular position on the ground—and grind on rails. 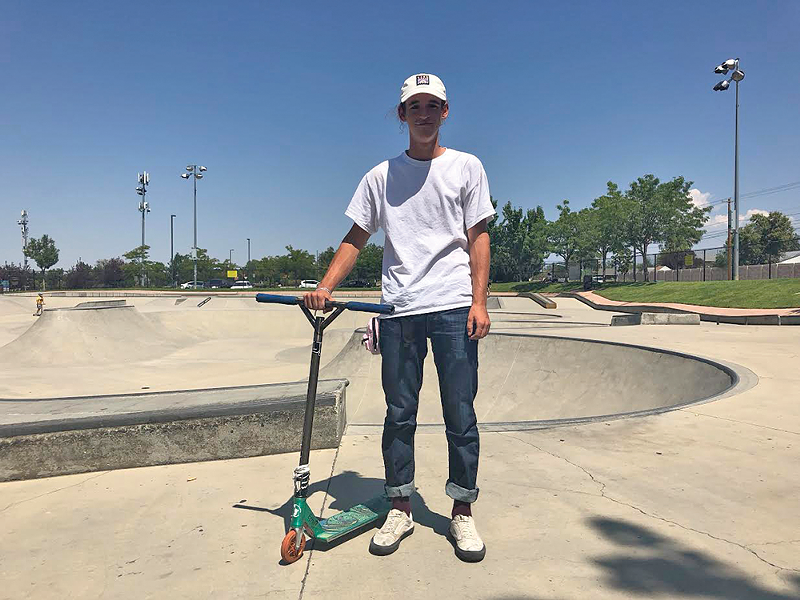 Benjamin Horton, a 16-year-old Taylorsville resident, has been scootering for a little more than a year. "They've been around for a while," he says of motorized scooters' lo-fi counterparts. "They're only getting bigger right now, too." Taking a respite from grinding on the park's rails, Horton waxes poetic on his extreme hobby's bright future. "Skateboarding and BMXing have been around forever, and scootering is just one of those things that's also going to be around forever," he says. From the sidelines, he's witnessed motorized scooters encroach on his sport of choice's terrain and become more mainstream. "You see a lot more adults riding bikes and stuff," he says of grown-ups' trendy means of getting around. "It's like that in-between thing, where I guess adults could be goofy and ride a scooter." Although decidedly more DIY, tricking-out Horton's old-school ride didn't come cheap. The Olympus High student estimates he's spent $700 on specialized performance decks, wheels and bars. And while not electric, he points out he can reach up to 15 miles per hour—just like those fashionable downtown scooter riders. Horton anticipates motorized scooters will be popular for Utahns seeking a greener way to get around, but thinks the environmentally conscious aren't the only ones who'll enjoy them. "Scooter-riders who ride at the skate park, they're probably gonna go have some fun on those electric scooters," he says. "On people's Instagrams, I have seen people use them to ride street and, like, do grinds with them." While physical similarities abound, there's a crucial distinction between electric scooters and foot-powered ones. Chief among them, the scrutiny that motorless riders face from local authorities. Although Wilking says the electric-powered scooters can only be ridden on certain roads, users generally experience more free reign over where they can ride versus their analog equivalents. "The only really good place to ride street with a lot of different street-riding spots is downtown," Horton says of the ledges, stairs and handrails that make for good trick opportunities. "Pretty much everywhere downtown, if you ride somewhere you'll get kicked out almost immediately, and so we don't have a lot of freedom down there." He understands why downtown business owners don't want scooter riders grinding on their stairs or scuffing up their buildings. "But if they could make different skate parks downtown meant for street riding that kind of just fit in with the scenery, that would be pretty cool," Horton says. "It would give us a lot more freedom with riding." DON'T drive on sidewalks or alongside TRAX like some sort of animal. DO be mindful of traffic signals and those around you. DON'T go all freestyle. Rush hour on State Street is not the best time or place to live out your X Games dreams. DO protect your melon by wearing a helmet whenever possible. DON'T be the first to be cited for tipsy scooter-riding. You’ll forever be a meme. DO have fun—and as evidenced by this cover story’s author—avoid curbs at all costs. 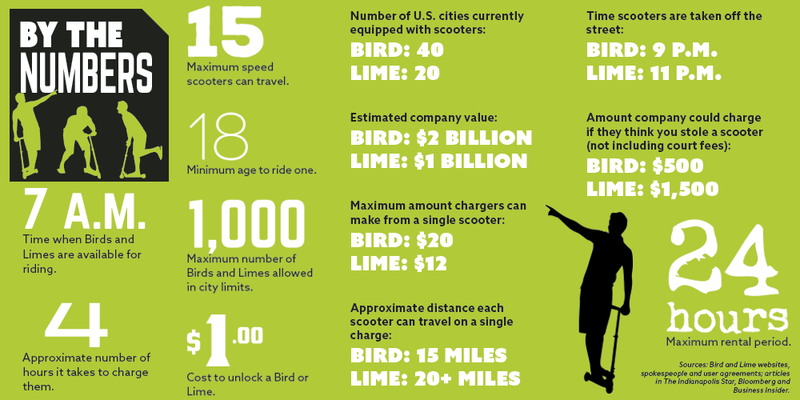 One month into the operating agreement the city inked with the dueling electric scooter behemoths, it's difficult to project what lasting impact Bird, Lime and future dockless competitors will have on the city. Math teacher by day/scooter charger by night, Jeff Zivkovic, recently posted on the Bird Chargers SLC Facebook group asking for permission to use other hunters' names in exercises he's formulating for his students at Bryant Middle School. "There's a lot of potential math problems there, with the prices of different Birds, the distances and locations, the arrangements of how you can fit them into your vehicle," he tells City Weekly. Zivkovic is fervent on his newfound role's contribution to a greater purpose. "I believe it's good for the city and will help clean our air," he says. Appealing to his philanthropic side and informing his classroom, Zivkovic believes scooters have evolved from gimmicky ways to get from Point A to B to welcome cityscape fixtures. "I think they've already become a sort of character in our community," the educator says. True to his transportation-director self, Larsen isn't so sure. "It feels like this has been going on forever," he says of scooters' urban landscape shakeup. "Who knows? Maybe it's just a flash in the pan. Something that five years from now, we'll say, 'That was so 2018.'" These scooters are faster than you'd think. On a recent Saturday, the wind blew through my hair as the first few minutes of darkness settled into the cool evening air. I should have felt euphoric as I rode that Lime scooter south down State Street, but mostly I was worried about being hit by a car and cracking my helmet-less head on the asphalt. Scared of trafficking in the busy road, I alternated between riding in the street and on the pedestrian-free sidewalk, my mood shifting every few seconds from freeing euphoria to neurotic terror. A regular cyclist, I'd like to think I posses an intuitive sense of where I should and shouldn't ride my bike. I strive to be mindful of situations that could put me at risk of injury, a knowledge developed through daily rides from my Sugar House apartment to City Weekly's downtown hive. In retrospect, scooting down State wasn't my wisest choice, nor was it legal, since SLCPD Detective Greg Wilking told me you can't ride them on roads with speed limits greater than 25 mph or wider than four lanes. But there were beers to be had, and this just looked so much more fun than taking TRAX or springing for a Lyft. Approaching a curb around Cleveland Avenue, I thought I'd be able to ride the scooter over the slightly elevated portion of the ramp that connects concrete to pavement. I thought wrong—and fell face first. By the grace of the scooter gods, I was able to soften my landing and come away relatively unscathed, sustaining just a few cuts and minor bruises, but no missing teeth or broken bones. I assessed my injuries, somewhat incredulous I wasn't more seriously hurt. Catching my breath, I picked myself—and the scooter—off the ground. I replayed in my head the proverbial "You'll shoot your eye out" conversations I'd had with Wilking and Jon Larsen, the city's transportation director: How the seemingly non-threatening devices could pose a threat to the non-scooting public; how the biggest complaint residents have voiced so far is the hazards posed by scoot-hogs riding on the sidewalk. I thought about ending my ride and how I should take a Lyft the rest of the way. Instead, still fueled by the thrill of the ride, I got back on the scooter and rode a few more blocks to the bar, only holding the throttle button about halfway down as I cut through the darkness. I rode in the street the rest of the way.